Doby, a curious and resourceful software engineer plays an online computer game that rapidly invades his computer and consumes his life. The game introduces Doby to Lynette, a sensual and shockingly intuitive character. She knows so much about him . . . Surely she must be more than virtual? As he discovers the games devious aim to dominate its players and punish (persecute?) those who choose to exit (turn away?). Doby attempts to escape from being sucked into this cult-like world . . . and to stay alive. 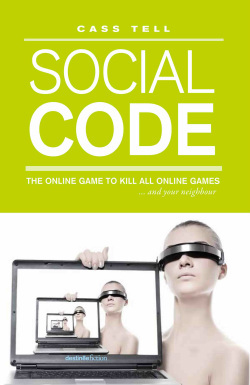 Welcome to Social Code . . . Here your deeper social and spiritual needs are fulfilled. Here your preferences are monitored for your advancement. Here you learn the secret terminology necessary to be an inside member. Here your unquestioning loyalty to the leader is rewarded. Here your passion for violence is tested, encouraged and . . . controlled. This book is available on online booksellers or order through your local bookstore. Available as a trade paperback or eBook.